Curry leaves are an essential ingredient in South Indian dishes . Curry leaves have medicinal properties Botanical Name- Murraya koenigiIndian Name- Curry patta Curry Leaf is flavorful and digestion friendly Leaf. It is rich in calcium and has vitamin A also.Its oil is said to prevent hair fall and delay hair greying. 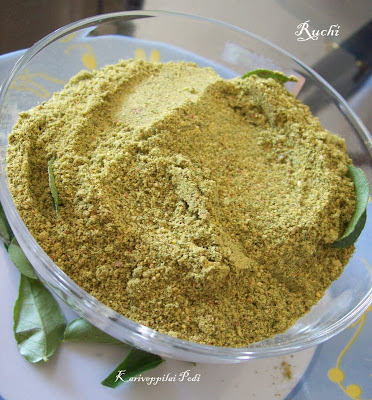 Nothing can beat the fresh flavour of homemade curry leaves powder. Curry leaves powder can be stored and used when needed. I love podis of all kinds. once they are made, they can be stored forever and whenever I feel not well not able to cook, we can always fall back on the podi.. Hot steamed rice with curry leaves powder and a tsp of ghee-wow! is just heaven! 1. Wash curry leaves and dry it well. 2. Dry roast, urad dal, channa Dal, pepper till you get a nice aroma. 3. Dry roasts red chillies for a few minutes. 4. Dry roast curry leaves well. Do not burn it . 5. Dry grind everything slightly coarse along with salt required. Podi looks fantastic, i would like to pick few spoons from u now itself...yummm! mmmm, kariveppillai podi looks fantastic dear!!! I love podi sore too, with a spoon of ghee on hot rice, mmm, it would be fabulous!!! I love the aroma of that podi! You have made it so good! This looks good,my favorite podi! My fav podi... looks yummyy... thanks for sharing!! akka, this is my most fav podi. my hubby loves it too and so this is a regular in my kitchen. fantastic colour!